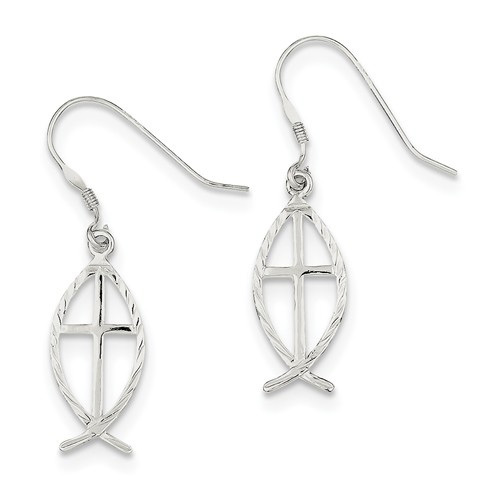 These silver Ichthus cross earrings from Apples of gold Jewelry allow you to wear the cherished Ichthus fish symbol as a fashionable piece of jewelry. The earrings are created in .925 sterling silver, and each measures 1 1/2 inches tall and are just under 1/2 of an inch wide. The open design of the Ichthus fish has a cross in the middle, and the texture on the fish itself has a twisting, almost rope like design, as well as French wire closures on the back of each. We guarantee our Silver Ichthus Cross Earrings to be high quality, authentic jewelry, as described above.